With a height of 6.962 meters (22.965 ft), Aconcagua is the tallest mountain in the Western hemisphere. It is located in the Andes, in Argentina, in the Province of Mendoza. 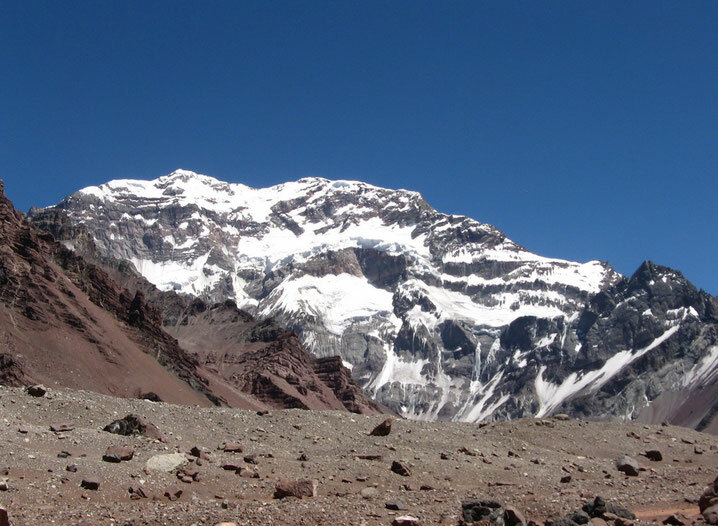 The mountain lies within the 'Aconcagua Provincial Park' which was founded in 1983. The boundaries of this area are defined by the Valley Horcones to the west/south-west and by the Vacas Valley to the east and north. The word Aconcagua has it's origin in two of the indigenous languages: From the Aymara Kon-Kawa it's meaning 'snow covered mountain' and from the Quechua Akon-Kahuak it's meaning 'centennial stone'. After different attempts of various parties, Aconcagua was first climbed in 1897 by the Swiss Mountain Guide Matthias Zubriggen. By now there are more than 30 different routes to the summit, which various difficulties. The normal route ascends the northeast face of the mountain. Over the years climbers have formed a serpentine path without technical difficulties. But, the effects of the altitude, strong winds and cold can make it very challenging to climb the mountain. The mountain's two peaks are connected by the one-kilometer long 'Ridge of the Guanacos', which marks the end of the 3.000-meter (9.900 ft) wall, the 'South Face'. This enormous wall, covered in ice, rock and snow, is one of the most challenging mountaineering objectives among all the classic routes worldwide. To enter Aconcagua Provincial Park, everybody must purchase a permit at the office of the Park in Mendoza. See more information at How to climb.